Ever heard of 3D Nand Flash technology? It’s the latest range in SSDs and many of the big tech giants will be rolling it out this year. This technology is a type of flash memory in which memory cells are stacked vertically in multiple layers to help achieve higher densities at a lower cost per bit. Ultimately, 3D Nand Flash can offer higher capacity in a smaller physical space compared to 2D Nand. More space for less money – makes sense. The introduction of Thunderbolt 3 technology as the new interface for USB Type-C cables, has presented a desktop-level performance from a mobile computer. This advancement in technology supports the fastest data transfer and most video bandwidth available on a single cable in the world. To get technical, it provides 40Gbps – doubling the speed of its predecessor and eight times faster than USB 3.1 – it will be a technological marvel this year! Virtual reality is here and 2016 has proven to be the year that it’s moved into the mainstream. However despite many VR headsets on general sale, there is still a need for VR content that fully lives up to expectations. Expect a new expanded offering of VR content not just from gamers but also the film industry, streaming services, and even new areas like visual novels and comic books. Users still need a solid enough reason to invest in VR headsets. As slick as they may look, content is king. From decor-friendly gadgets and wireless power controls, right through to sophisticated security systems, advances in technology continue to make it easier to make homes smarter and safer, and it seems homeowners are waking up to the value. Day-to-day tasks are made simpler and it’s inevitable that more exciting smart home products will come to market this year. This year, sales of general smart home devices are up 21% at reichelt.co.uk, with one of the best-sellers being the Konig Smart home security starter set. Robots are reaching a whole new realm of realism and this year promises to deliver a new generation of robot. The arrival of these mechanical companions is making the unthinkable a reality. We’ve already seen the announcement drone deliveries and there will be a whole host of new robotic product launched as the year goes on. Our fascination with A.I is fuelling the advancement of this technology at an alarming pace. Our robot friend, the Ubtech Humanoid Alpha 1S has been a hit so far and we’re predicting he’ll be just as popular throughout 2017. 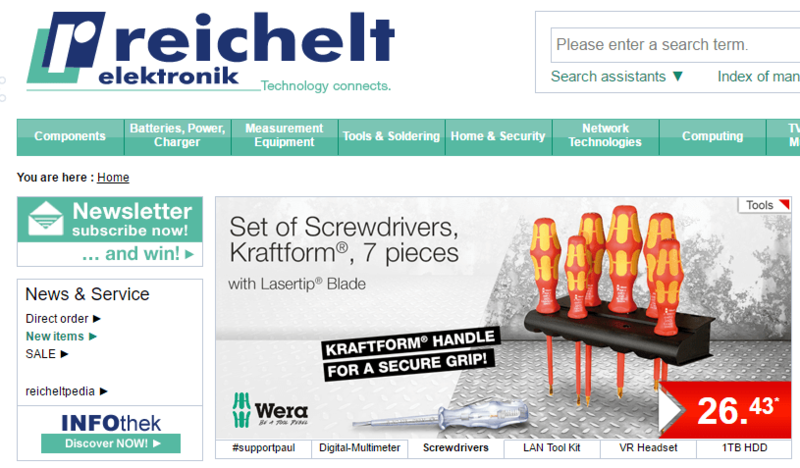 As well as its robotic kits and smart home range, reichelt.co.uk offers a wider variety of tools, components, tech accessories and more – offering many items up to 20% cheaper than elsewhere in the UK.